The Nishnawbe Aski Development Fund Business Award recipients, left to right, Jasen Dowhaniuk, Desiree Morriseau-Shields, Susan Buchanan, Ron Wesley for Nuna Logistics, Tina Gagnon, Kiara Paterson and Victor P. Linklater, were honoured for their achievements during the Oct. 20 gala dinner awards ceremony at the Valhalla Inn in Thunder Bay. Photo by Rick Garrick. Twelve-year-old Kiara Paterson, of Whitesand, was recognized for her successful Kakes and Kupcakes by Kiki business on Oct. 20 at the 27th Annual Nishnawbe Aski Development Fund Business Awards. Paterson says most of her orders come from the Facebook page her mother originally created to provide her with orders to practice her baking skills. Paterson is currently looking to expand her kitchen so she has more space to do her baking. Paterson’s personal goal is to travel to Paris, France to learn more about food preparation. “They have the best culinary schools,” Paterson says. Deputy Grand Chief Derek Fox says Paterson’s Award of Recognition for the Year “speaks volumes” about the advancement of First Nations youth. 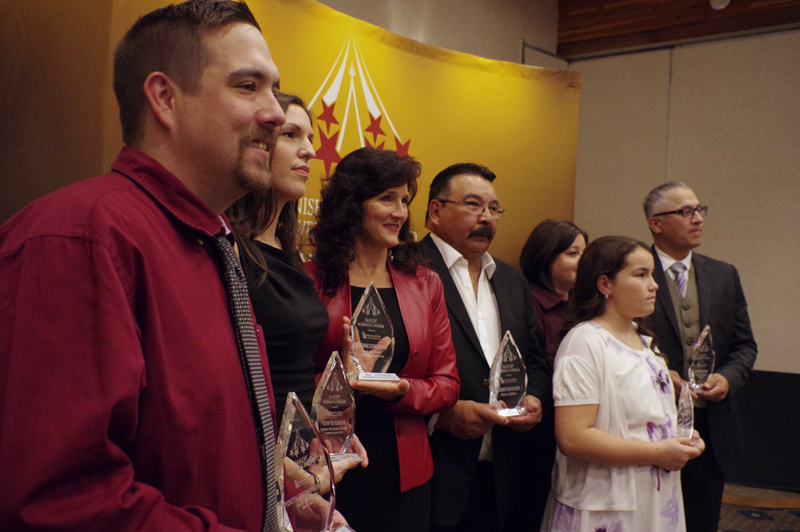 The other NADF Business Award recipients were Victor P. Linklater for Businessman of the Year; Susan Buchanan for Businesswoman of the Year; Tina Gagnon for Partnership of the Year; Nuna Logistics for Corporation of the Year; Desiree Morriseau-Shields for New Business of the Year; and Jasen Dowhaniuk for Youth Entrepreneur of the Year. Buchanan, owner of Susan Buchanan Education Group, feels grateful for being presented with the Businesswoman of the Year Award. Employment, Workforce Development and Labour Minister Patty Hajdu says the NADF Business Awards, which were held at the Valhalla Inn in Thunder Bay, is a phenomenal way to celebrate the contribution of Indigenous people to the economy of northwestern Ontario. The NADF Business Awards were live streamed by Wawatay Native Communications Society and Theymedia.